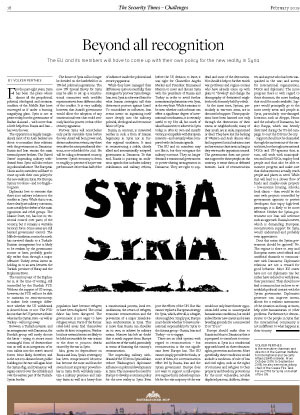 For the past eight years, Syriahas been the place where almost all the geopolitical, political, ideological and sectarian conflicts of the Middle East have converged as if under a burning magnifying glass. Syria is not at peace today, but the government of Bashar al-Assad – with more than a little help from Russia and Iran –has won the war. The opposition is largely marginalized; most of its Arab backers are about to normalize their relations with the government in Damascus. Russia and Iran remain the main external power brokers. The United States’ impending military withdrawal from Syria will also reduce its political influence. The European Union and its members will have to come up with their own policy for the new reality in Syria. For Europe, Syria is too close – and too fragile – to ignore. Diplomats love to reiterate that there is no military solution to the conflict in Syria. While this is true, there clearly are military outcomes, most notably the defeat of the main opposition and rebel groups. The Islamic State, too, has lost its territorial control over parts of the country, but it remains a veritable terrorist force. Some areas are still beyond government control: The Idlib de-escalation zone in the north has survived thanks to a Turkish-Russian arrangement but is likely to be retaken by the government sooner or later, probably gradually rather than through a major offensive. Turkey seems intent on holding on to an area between the Turkish province of Hatay and the Euphrates River. The territory east of the Euphrates is, at the time of writing, still controlled by the Kurdish PYD. Without the support of US troops, however, the PYD will not be able to maintain its semi-autonomy. It makes little strategic difference whether the US withdrawal is slowed down or not. The PYD knows that the US presence is finite, whereas the Syrian state – as well as Turkey – will not go away. Between a Turkish invasion and an arrangement with Damascus, the Kurdish group will surely choose the latter – trying to secure some meaningful form of decentralization as well as an integration of its own militia into the state’s armed forces. Most likely, therefore, and in the not-too-distant future, public buildings in the east will again hoist the Syrian flag, and Damascus will regain control over the oil fields and over the eastern part of the Turkish-Syrian border. The future of Syria will no longer be decided on the battlefield or in UN-led political negotiations. The new UN Special Envoy for Syria may be able to set up a constitutional committee with credible representatives from different sides of the conflict. It is very unlikely, however, that Assad’s government would allow the adoption of any constitutional text that could seriously limit his powers or that of the security apparatus. Postwar Syria will nonetheless only partly resemble Syria before the war. Assad will be in power and, absent unforeseen events, stay there even after the next presidential elections, now scheduled for 2021. He will be ruling a devastated country, however: Syria’s economy is down to roughly 50 percent of its pre-war performance. More than half of the population have become refugees or have been displaced. The social fabric has been disrupted. The government is not eager to have refugees return. Parts of the former rebel-held areas find themselves under de facto occupation. Neither local nor external actors are likely to be held accountable for war crimes or the close to 500,000 deaths caused by the war in Syria. Also, given its dependence on Russia and Iran, Syria’s sovereignty has been compromised. Moscow has become the most and Iran the second most important powerbroker in Syria. Both will likely maintain a military presence and military bases as well as a heavy dose of influence inside the political and security apparatus. While they have managed their differences quite successfully, their strategies for postwar Syria diverge. Iran sees Syria as a forward base for what Iranian strategists call their deterrence posture against Israel. To consolidate its influence, Iran seems intent on ingraining itself more deeply into the military, political, ideological and economic fabric of Syria. Russia, in contrast, is interested neither in such a form of Iranian hegemony in Syria nor in further regional escalation. It aims at reconstituting a stable, closely allied and internationally accepted government in Damascus. To that end, Russia is pursuing an ambitious agenda that includes military stabilization and military reform, a constitutional process, local reconciliations, the return of refugees, economic reconstruction and the prevention of a major Israeli-Iranian confrontation in Syria. This is more than Russia can shoulder on its own, or achieve by military means. Moscow has left no doubt that it needs support from Europe and the rest of the world, particularly in terms of financing the country’s reconstruction. The impending military withdrawal of the US from Syria will also reduce Washington’s diplomatic influence on political developments in Syria. This increases the need for Europe to develop a common policy for the new reality in Syria. Even before the US decision to leave, it was right for Chancellor Angela Merkel and President Emmanuel Macron to meet and discuss Syria with the presidents of Russia and Turkey in order to avoid further international polarization over Syria, at the very least. While it remains to be seen whether such a format can effect a significant degree of international coordination, it is certainly useful to try. Not all, but much of what Russia tries to achieve in Syria today, i.e. after its own and Assad’s victory, is compatible with European interests – and certainly when compared with the Iranian agenda. The EU and its members may not like it, but they recognize the military outcome. They no longer demand a transitional government or power-sharing arrangements in Damascus. They are right to support the efforts of the UN. But this cannot replace a European strategy for Syria, which, after all, is a fragile, close neighbor. Simply put, Europe must decide whether to leave international responsibility for Syria to the Astana group – Russia, Iran and Turkey – or to engage. There are no ideal options with regard to reconstruction – but reconstruction is the one significant lever Europe has. The EU cannot simply provide the funds, or most of them, for a reconstruction effort led by Russia, Iran and the Syrian government. Europe does not want to support a still-repressive regime that is indeed responsible for the vast majority of the war dead and most of the destruction. Nor should it help to further enrich war profiteers and regime cronies who have already come up with plans to “develop” and change the demography of devastated neighborhoods formerly held by rebels. Europe should make clear to Russia and thus to Damascus that it is prepared to contribute to reconstruction in Syria in a conditional approach based on three elements: rights, protection and access. More specifically, these conditions would include a modicum of rule of law and civil rights, such as the rights of returnees and refugees to their property and freedom; protections for the most vulnerable, notable displaced persons, children, detainees and anyone who has been vanquished in the war; and access for international organizations, NGOs and diplomats. The more progress there is with regard to these elements, the more funding that could be made available. Support would principally go to the most needy areas and people in Syria, particularly war-damaged locations such as Aleppo, Homs and the suburbs of Damascus, but also Raqqa, which was heavily destroyed during the US-led campaign to oust the IS from the city. Support should not be channeled through the institutions of the central state, but through international NGOs and UN agencies that, in turn, will work with municipalities and local NGOs, employ local people and thus also be able to monitor progress and make sure that disbursements actually reach people and places in need. While this will lead to a slower flow of funds and smaller-scale projects – low-income housing, schools, local clinics – than would be the case with projects controlled by government agencies or private developers that enjoy high-level patronage, it is likely to be more effective. Neither the Syrian government nor Iran will welcome such an approach. Russia, however, which is demanding European reconstruction support for Syria, would understand and probably even appreciate it. 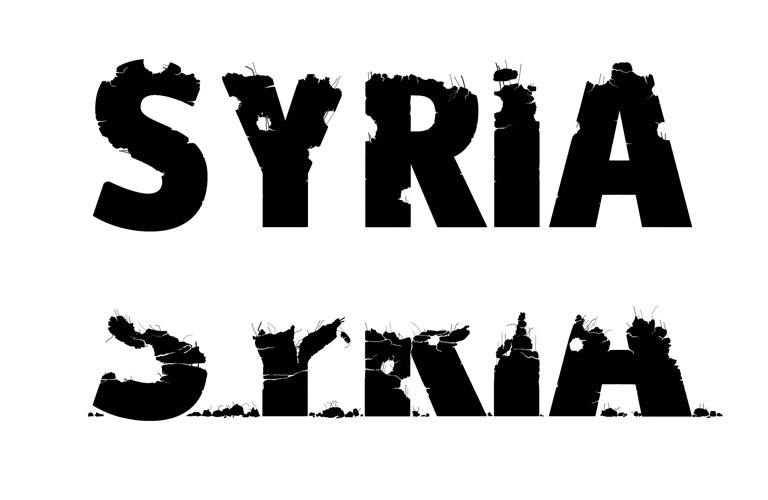 Does this mean the Syrian government should be ignored? No. The regime is there to stay and European states need official and unofficial channels to communicate with Damascus. Diplomatic relations are not a reward for good behavior. Most EU states have not cut diplomatic ties but rather have reduced or withdrawn their personnel. They should now find a common line on how to reestablish political contact with the Syrian government. Diplomatic presence can improve access, allows for a realistic assessment of the situation and may, at times, help solve humanitarian or other problems. Furthermore, it demonstrates to the people in Syria that the international community is not indifferent to what happens in their country. is the executive chairman and director of the German Institute for International and Security Affairs (SWP) in Berlin. From October 2016 to September 2018, he also served as acting chair of the Cease Fire Task Force (CTF) for Syria on behalf of the UN.